Friday October 25 1907 I swept the whole house and put it to rights this forenoon, baked bread and got the dinner. Billy was not here today. Will and I went down town at 1.37 I did some errands and was into the 5 ct picture show with Will. When we came out of there, we heard that [Monley?] Moore had suffered a stroke of apoplexy. We did the evening work. I read some. Saturday October 26 1907 It was colder today. We went down to visit George & Flora Stevens we had such a nice trip. They expect to leave the farm the 1st of March. We learned early this morning that Dr Moon had died during the night. too bad! too bad! I felt very tire with the ride went to bed early. Sunday October 27 1907 It was a cold windy day. I did not feel like going out of the house and was busy in the kitchen all forenoon. In the afternoon and evening I wrote letters to Lizzie Lindley, Aunt Sarah, Nellie and Lydia. 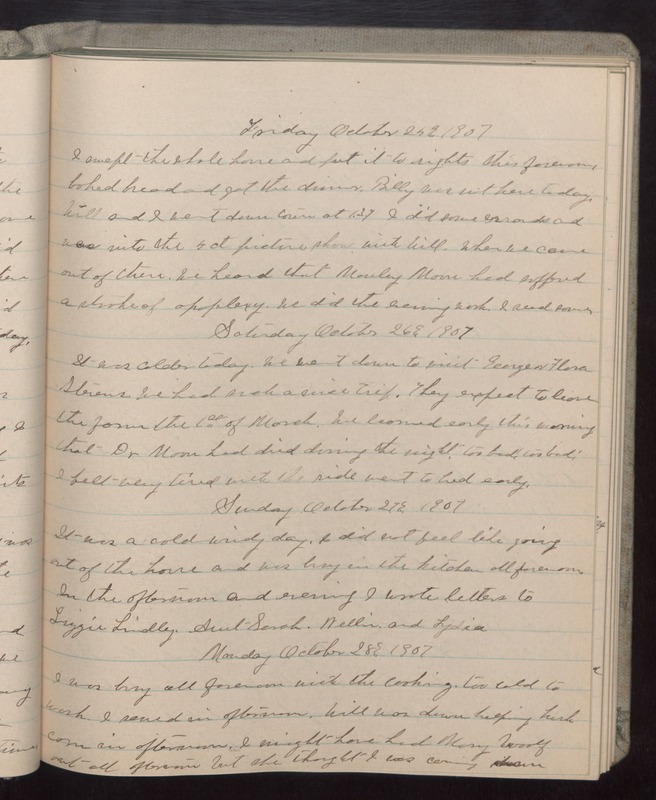 Monday October 281907 I was busy all forenoon with the cooking. Too cold to wash. I sewed in afternoon. Will was down helping husk corn in afternoon. I might have had Mary Woolf out all afternoon but she thought I was coming down.